Think Burrus Blog: Did Mother Nature cause corn disease to be a problem in 2014? Did Mother Nature cause corn disease to be a problem in 2014? The main foliar corn diseases that were observed within the Burrus footprint during the 2014 growing season were as follows: gray leaf spot, northern corn leaf blight, and Goss’s wilt. All of these foliar diseases can significantly decrease yield, especially if their lesions cover leaves near the ear at corn pollination or cover upper leaves during grainfill. 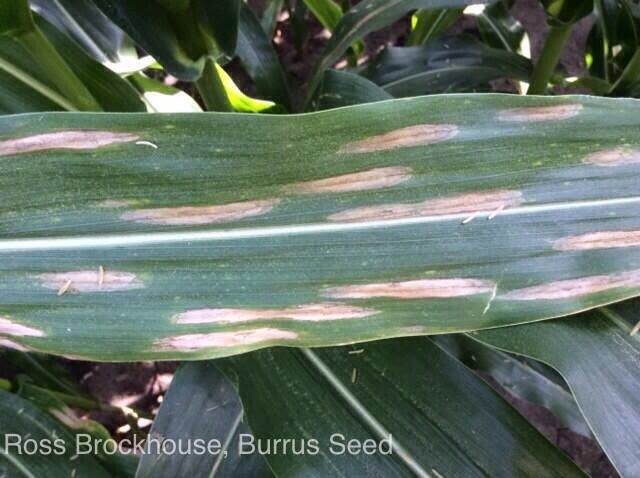 Every corn hybrid has a disease rating for gray leaf spot, northern corn leaf blight, or Goss’s wilt. Check the disease rating for your hybrid and if it is a low number, you could more likely to benefit from use of a fungicide (for gray leaf spot or northern corn leaf blight) at corn pollination. When it comes to plant disease spread, we usually assume a rainy season, humidity, moisture, and even dew are favorable conditions for foliar corn diseases. Some made the assumption that most areas were getting precipitation during the 2014 growing season, but in reality, some areas received minimal rainfall in July within the Burrus footprint during corn pollination. In addition, most plant disease pathogens require a narrow range of specific temperatures, before they will sporulate or initiate infection. Gray leaf spot, a fungal disease, started to appear on susceptible corn hybrids in southern, western, and in areas of central Illinois in mid-July during 2014, just a few weeks before pollination. These were areas within the Burrus footprint with the earliest planting dates during 2014. So, the question was, why were we not seeing gray leaf spot in other areas of the Burrus footprint? One reason could be that some corn fields may have had less residue present, which could harbor disease. Another reason could be that the last few growing seasons were dry and there might be less build-up of disease inoculum within residue. But, the main reasons were that some areas might not have been humid or temperatures were not favorable. Gray leaf spot requires warmer temperatures (75° -85°) for disease infection to occur and if conditions stay conducive, symptoms will develop after several weeks. The average temperature range in northern Illinois, Wisconsin, and Iowa was 65° - 70° during July. Another disease called northern corn leaf blight began to be visible on susceptible hybrids in the Northern part of the Burrus footprint in mid–July of 2014. This is because northern corn leaf blight symptoms will develop at lower temperatures, when compared to gray leaf spot. Gray leaf spot symptoms typically appear first on lower leaves because it overwinters on residue. A wound is not needed for the infection of gray leaf spot or northern corn leaf blight disease. Northern corn leaf blight also overwinters within corn residue, however spores can blow into fields from very, long distances, then infect susceptible hybrids. Lesions can develop every 7 - 12 days in a favorable environment. Northern corn leaf blight causes larger “cigar shaped” lesions, when compared to gray leaf spot symptoms, which are small, tan, and rectangular in shape. Northern corn leaf blight causes larger lesions and can spread a bit quicker when compared the gray leaf spot; therefore, we become a bit more concerned about this disease in growing seasons that are favorable for northern corn leaf blight spread and infection. Based on disease scouting during pollination, disease pressure, and forecasted wet weather, the grower can make the decision if a fungicide application is needed. Northern corn leaf blight seems to be advancing at the most rapid rate of the afore mentioned diseases. Another corn disease that made an appearance during early August within northern Illinois, Wisconsin, and Iowa was Goss’s wilt. It is a leaf blight caused by a bacteria that infects after corn silking; however, on rare occasion, this bacterial pathogen can also cause a systemic wilt. This bacterial pathogen can survive in corn residue from 10 months - 2 years. Many think that it is becoming more widespread because of susceptible hybrids, corn after corn rotations, conservation tillage, and favorable weather. Most of Burrus hybrids have fairly good Goss’s wilt ratings, but keep in mind, no hybrid is immune from this disease. Since Goss’s wilt is a bacterial disease, fungicides are useless. The main way to manage this disease is to plant resistant corn hybrids. Goss’s wilt favors temperatures from 70° - 80° for infection and the average tempertures in parts of northern Illinois and southern Iowa during mid-July to August were within the favorable range for Goss’s wilt infection to develop. But, in order for bacterial infection to occur, there must be wounds made by hail, blowing debris, or other mechanical injury. One example of a storm that brought hail occured on June 30th and this is only one of many storms that occurred during 2014 that could have caused wounding for entry of the Goss’s wilt bacteria, which was needed for disease infection to take place on susceptible corn hybrids. Lastly, at the end of the 2014 growing season, there were many concerned that there could be some issues with corn root lodging or stalk lodging at harvest. Often times, if early corn growing conditions consist of no stress before pollination (high moisture or nitrogen), which most likely increases the potential of grain production, but later in the growing season (post pollination), factors can take place that hinder corn photosynthesis, which can hinder the flow of sugars to grain. Sugars can then be taken from the stalk, which could predispose the corn plant to be infected by stalk rot pathogens. In fact, research has shown that high incidences of foliar diseases such as gray leaf spot, northern corn leaf blight, and Goss’s can indirectly predispose corn to stalk rot. In addition, insects such as corn rootworm larvae can feed on roots and cause root lodging. European corn borer (ECB) (usually the 2nd generation) can tunnel into the corn ear shank and cause ear dropping or tunnel into the stalk and cause stalk lodging. Of course, ECB injury is more often found on corn hybrids without GM traits to help suppress or control the ECB. Often times, if there is ECB injury above the ear, stalk rot can ensue. Depending on soil type, amount of soil moisture, and root development, corn hybrids can be blown over during a wind event. However, some strong winds can overcome the best root development. Corn damaged due to weather can be more susceptible to disease and infection of stalk rot pathogens at points of injury on the stalk. For example, if hail occurs after pollination, stalk rot is almost always inevitable. On June 30th, massive storms swept through areas of the Burrus footprint. The winds and hail that this storm brought were a true evaluation of the strength of the corn hybrids, which were nearing growth stages during pollination. Other stresses such as high plant populations, extremes in soil moisture, nutrient deficiencies or imbalances, cloudy weather, drought, corn-on-corn rotations, high ear placement, or hybrid stalk strength can cause corn to be prone to lodging or stalk rot. High plant populations can increase plant competition for light and reduce stalk diameter. Extremes in soil moisture can cause root rot or compromised roots due to lack of oxygen. We were especially concerned with nitrogen loss this year. If corn plants are without adequate levels of nitrogen, they could be less vigorous and put all their energy into grain development; therefore, stalks could be compromised and more likely to be infected by stalk rot pathogens and lodging. On the flip side, corn growing within higher nitrogen levels (promotes lush foliage growth) along with low levels of potassium (encourages premature stalk death) can also cause corn to be more prone to stalk rot or lodging. Late season cloudy weather, which occurred mostly in the northern part of the Burrus footprint in 2014, may hinder photosynthesis in order to keep ears alive. If the drought threshold of corn is reached, this could also cause a drastic reduction in photosynthesis, so irrigation should not be reduced during grain fill. Why are my Soybeans Lodged in 2014? What Causes Lighter Grain Test Weight?